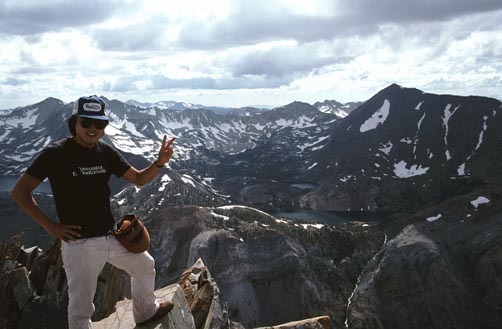 I had done this route, the Northwest Ridge, with the Sierra Peaks Section in September, 1979. It was such a good, interesting lead, that I chose to schedule it for the benefit of those eager, local climbers that wouldn't know the way. There are many turns, and places where poor route-finding could lead to dangerous and difficult climbing, or even a dead-end. Meeting a group of three other strong climbers at the hiker parking at Convict Lake, we took the trail that leads around the northwest side of the lake. At the upper end of the lake, which is no short walk, we turned left off the trail and crossed the stream. A log helped well on this. We headed up the large talus gully that leads to the Northwest Ridge. I had plenty of pictures and memories from the 1979 climb, so I knew exactly where to head. We had a nice sight of the Sevehah Cliff across the way. At a split of gullies, where the SPS leader had gone wrong, and cost us several hundred feet having to climb back down, I saved our group that annoyance. Then, things weren't so clear. Clouds blew overhead, and the sky spit some snow on us. I had my doubts, and wondered whether to abort. I decided to check the route just a bit further over some steep boulders, and then I saw the route on the ridge. It was clear from then on. The sun reemerged, and the word was, "Go!" I repeatedly warned the others of a steep, loose section with dangerous rockfall. I wanted to try a rocky fin that forms the ridge proper, since I had gone the loose, high class 2 way last time. Against my repeated directives to go one at a time, the group decided that they would go three at a time. I was busy doing high class three or four on the nearby fin, and having a great climb. But, over on the loose section, one of the others got ahead, and began kicking rocks down on the lower two. They shouted at him, but he replied that there was no place that he could stop. I knew he just doesn't like exposure. If they would only have listened to me! The rocks missed them, and they continued on to the top of the section, where I rejoined them. No matter what a leader could do or say, they were too independent of mind to heed an obvious danger and an official warning. The ridge was followed to the summit. The old guidebook says that this route goes on "forever." As one plods steadily on, the truth in that becomes almost apparent. The clouds stayed far enough away that we enjoyed the view. 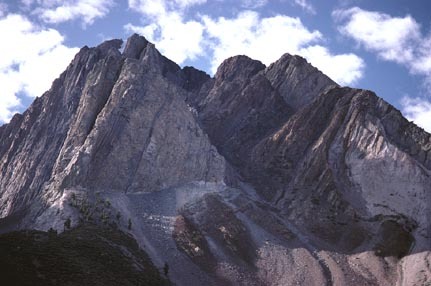 Red Slate Mountain, to the south, was ominous. We signed in the register. I snapped our photos, then we started down the easier, east side of the peak. One gets a good scree run for several hundred feet, to run into hardpan and loose rock. We then had to go slowly, then traversed over left to another slope. A convenient snow finger enabled me to run a standing glissade. Then we emerged onto dirt slopes, and had a run to the bottom of the high canyon. Others refreshed themselves on water from the small lake. Then, we started down the sagebrush covered, dirt and rocky, gentler slopes of "Morrison Canyon," as we Ski Mountaineers call it. From here, it is still a 2,000 foot descent back down to Convict Lake. One hiker wished that it was over already. At about dusk, we reached the paved road that runs on the east side of the lake, then hiked slowly back to the cars. All of them had enough. My planned peak climb for Sunday was to have no one. I suppose this is forgivable, but laughable, considering the egos that some of them have. I heard their showy excuses for why they declined the next peak. The next day, I wound up doing a short hike led by a volunteer from the Mono Lake Committee. We were shown about the South Tufa Area. The weather was now solid overcast, so it was just as well. I scheduled this again for another year, but I only received one call. If you have to lead, you might as well have a good group. But, maybe the word of this strenuous climb (6 miles, 4,800' gain, round trip) had gotten around, or maybe a warning about one crazy peak leader!